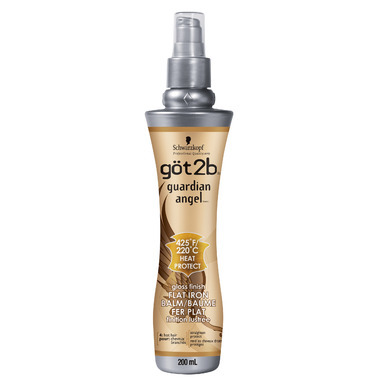 Be invincible with Got2b Guardian Angel Heat Flat Iron Balm formulated with proven 425ᵒF/ 200ᵒC heat protection plus patented combined styling support. There's no more need to go any hotter. This flat iron straightening balm moisturizes and insulates your hair from flat iron frying to provide long-lasting sleek, frizz-free locks with luminous shine effects. Forget the styling sins of the past, your hair's flat-out invincible now. Directions: Hold bottle 20-25 cm from hair. Spray all over towel-dried hair prior to blow drying. If spray nozzle clogs, run under hot water. This stuff does the job, when your hair is thin it's very hard to find products that work. This stuff doesn't weigh down my hair at all or leave a residue. I personally loved the product! I have a hard time finding a prodcut that actually works with my hair (thin and curly) and this worked great! The smell was fine at first but a little off when it got heated, after a few uses though I got used to it! Average effect with a Horrible smell. There's got 2 be better stuff out there. Honestly, I think this product all depends on your hair type, I use it all the time after my showers. It leaves hair silky, with ends that don't brake off very much. I have layered wavey hair, and it works wonders on my hair. If hair is overly curly, then it isn't something I would recommend to your hair. Although, it is very inexpensive in any store. It tops any costly produces. I love this product! Before, I NEVER used products on my hair, because I felt like it made my hair greasy, and different, and not as soft. I started using salon brand shampoo and conditioner, which helped my hair grow longer without getting horrible split ends like i did all my life before. Then I started straightening my hair more often, but even with the good shampoo, my hair started to get dry and split ends, and disgusting. So when I started using this, my hair actually got REPAIRED, and now I can straighten is as much as I want, and my hair is soft, moveable, amazing to touch, shiny, there are no split ends at all! and it just amazes me. It doesn't feel like I have any product in my hair!! My hair dresser uses got2be products in her salon, and recommends this brand to everyone, so now I really have trust in it!!! I bought this hoping that it can make my hair still look moisturize after I iron it. After one time, I never used this anymore. It smells horrible, I sprayed it twice and it felt like my hair was already overdose with chemicals. and it did nothing to fix my dry looking hair! Doesn't really work. It smooths your hair out and smells good and makes it silky, but it in no way protects your hair from a straightening iron and it really didn't make straightening easier... it basically dried out my hair more.